The party’s 10 MPs have proved reluctant to vote with the Tories since the terms of the draft deal emerged and scrapping their £1billion confidence and supply agreement they made with Theresa May would be a major blow to the Prime Minister. 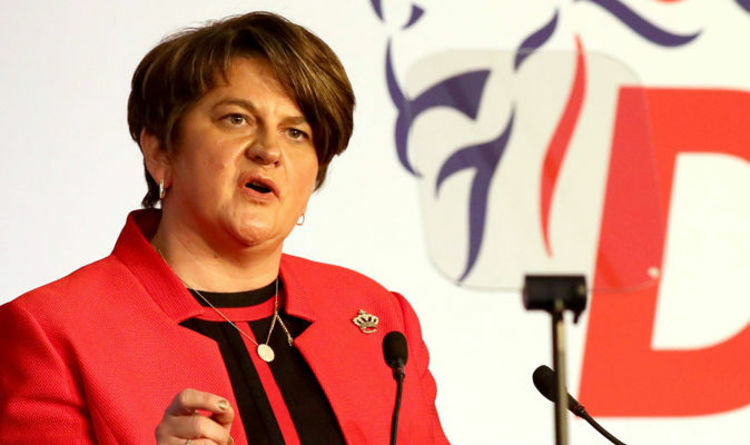 And although Ms Foster did not mention the DUP's pact to vote with the Mrs May’s Government – made after the general election - she told her annual party conference in Belfast the constitutional implications for the draft EU deal "cannot be ignored". She said: “The Democratic Unionist Party has never been afraid to say yes when it is right to do so, nor to say no when required." Ms Foster continued: "We do not stand alone on these issues, with a large number of Conservatives - both those who voted leave and remain - not persuaded. Even Jeremy Corbyn isn't buying the sea border. "This party wants to see a negotiated and orderly withdrawal from the European Union - that has always been our position. “We are not campaigning for a no-deal exit nor do we want barriers to trade between Northern Ireland and our neighbours in the Republic. “The choice is not between this deal and no deal, despite what the Government spin machine may say. "The reality is that if we are to secure a better outcome than is currently on offer, then the only option is to look beyond this current draft withdrawal agreement and work in the time ahead for an improved outcome." Chancellor Philip Hammond had earlier sought to reassure the DUP over its "understandable concerns" about the Northern Ireland backstop provisions aimed at preventing a hard border with Ireland. Mr Hammond said he believed the deal was better for the UK than staying in the EU and stressed it will help heal the divisions caused by Brexit. He said: “It's a way of leaving the European Union with minimum negative impact on our economy. "Economics is not the only consideration - we also have to look at the political healing process, bringing our country back together because countries that are disunited and divided are not successful countries. "If we want this country to be successful in the future, we have got to bring it back together after this process." He warned a no-deal Brexit would unleash "economic chaos", adding: "If the meaningful vote is lost we are in uncharted territory. "We will be faced with potential economic chaos. I am sure we would get a very negative reaction from the business community, from investors, from the markets." He added "we might end up with no deal, we might end up with no Brexit" if the Withdrawal Agreement is blocked by Parliament. DUP Westminster leader Nigel Dodds used his speech to the party conference to urge Mrs May to ditch her Brexit plan. Guest speaker Boris Johnson, viewed as a potential leadership rival to Mrs May, was given a rousing reception at the conference. He said the UK was on the verge of "making a historic mistake", telling the Belfast crowd: "Unless we junk this backstop, we will find that Brussels has got us exactly where they want us - a satellite state."